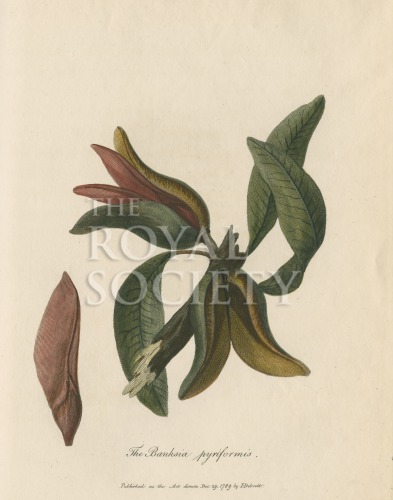 Botanical study of the woody pear (Xylomelum pyriforme) a tree native to Australia and first collected by Sir Joseph Banks and Daniel Solander. Plate 21 from Journal of a voyage to New South Wales...by John White (J.Debrett, London, 1790). The accompanying text describes this plant as “Banksia with solitary flowers, ovate downy capsules, and lance-shaped entire smooth leaves”.